Osaka. Laid down at Hitachi Zosen K. K.'s Sakurajima shipyard. Completed. 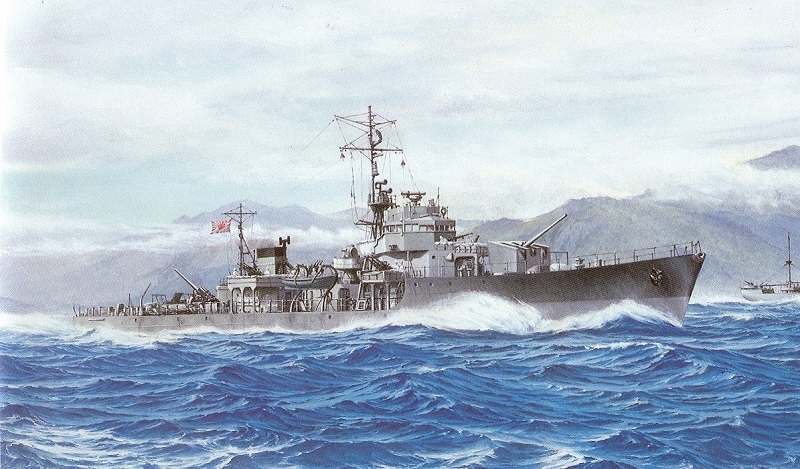 LtCdr Ichinose Shiro is the CO. Assigned to the Kure Guard Unit. Reassigned to the Maizuru Naval District in the newly formed 51st Division. Nanao Bay. While on a training mission, HABUTO strikes a mine, probably laid by a 20th Air Force B-29 heavy bomber, about a mile north of Kannonzaki light. HABUTO strikes another mine 1.6 miles north of Kannonzaki and is damaged. Sea of Japan. Escorts convoys between western Japan and South Korea. While escorting a convoy, HABUTO’s crew is notified of the termination of war. Departs Uraga on her first repatriation voyage. Arrives at Palau. Embarks troops and passengers to be repatriated and departs later that day. Arrives at Truk. Embarks troops and passengers to be repatriated. Enters dockyard at Uraga for repairs. Arrives at Saipan. Embarks troops and passengers to be repatriated and departs later that same day. Enters Uraga dockyard for repairs. Arrives at Guam. Embarks troops and passengers to be repatriated. Arrives at Saipan. Embarks troops and passengers to be repatriated and departs later the same day. Enters Sasebo Dockyard for repairs. Arrives at Korojima. Embarks troops and passengers to be repatriated and departs later that same day. Singapore. Ceded to the United Kingdom as a war reparation. Thanks go to Dr. Higuchi Tatsuhiro of Japan. Thanks also go to Jeff Donahoo of Iowa for help in identifying the CO.